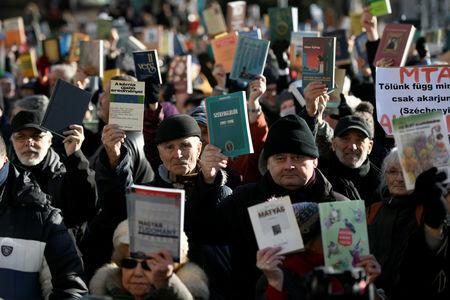 BUDAPEST (Reuters) - Hungarian scientists held books above their heads as they protested on Tuesday against government plans to reorganize the Hungarian Academy of Sciences' research and funding to try to reap more economic benefits. 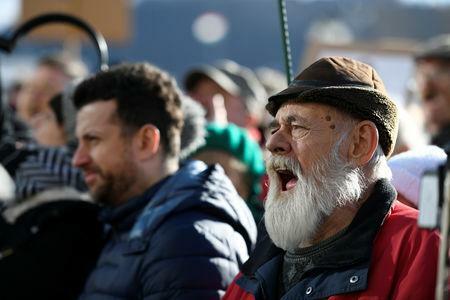 "The current situation, which keeps 5,000 MTA researchers and staff in an existential and scientific limbo, threatens the future of the entire Hungarian scientific community," academy workers said in a statement on their website. "The guarantee to generate economic benefits from knowledge is still missing from the research and innovation system," he wrote. "The increase of domestic industry's added value is possible only if they concentrate their resources." 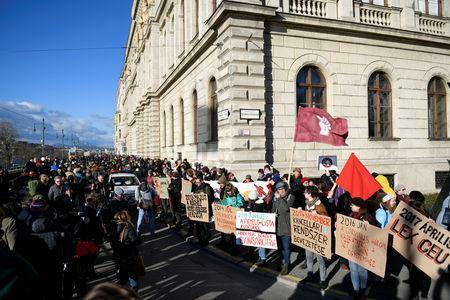 The protesters in Budapest held up signs saying "MTA is not an ATM". They brought scientific books with them, which they held aloft in a reminder of the importance of independent science. Orban's move to revamp various parts of society have drawn criticism from international partners, including a resolution in the European Parliament last year to sanction Hungary for flouting EU rules on democracy, civil rights and corruption. Orban has rejected that. Its shift to Austria was the culmination of a long struggle between Hungarian-born Soros, who promotes liberal causes through his charities, and Orban's government. "We see that in today's Hungary many things can be done even in the university and scientific fields. We see what happened to the CEU," he said. "One thing I am certain this isn't is an attempt to make research more efficient."